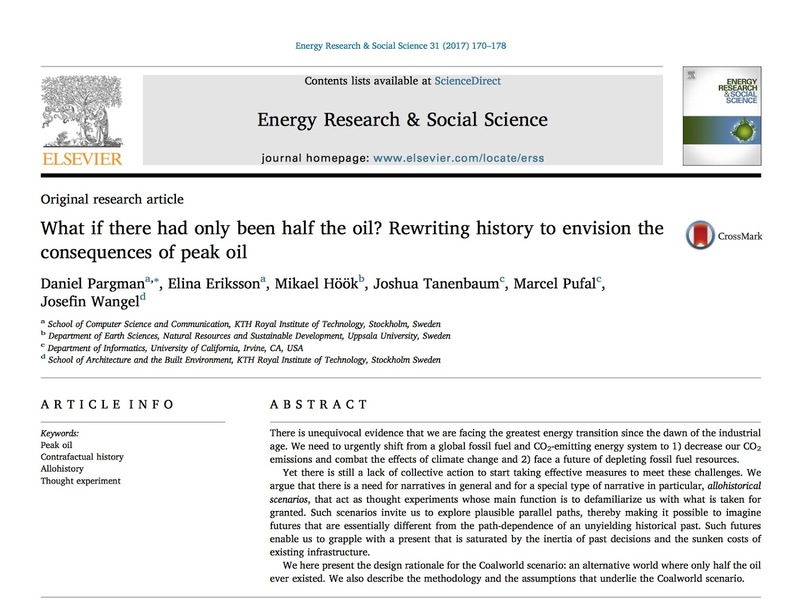 My first-ever article that is not about computing has just been published (it's about peak oil and sustainability). The publisher (Elsevier) informs me that the article is publicly available for free for for everyone for 50 days (until November 7) if you follow this link. The article will unfortunately not be available under open access after that since there is no research project that backs it up (and that could pay the fees for setting the article free). I should at some point also closely read Elsevier's sharing policy. The article, "What if there had only been half the oil? 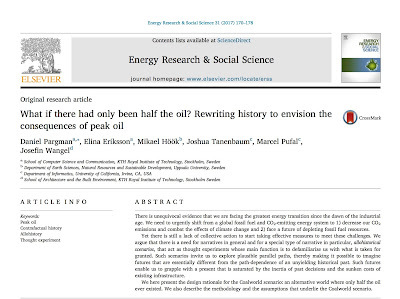 Rewriting history to envision the consequences of peak oil" is an exercise in contrafactual history ("what if...?") and it is written by Daniel Pargman, Elina Eriksson, Mikael Höök, Joshua Tanenbaum, Marcel Pufal and Josefin Wangel. Since this is a strange bird - it's not every day you get an article about contrafactual history published in a reputable academic journal - we were indeed very lucky to have it published in the exact right venue; in a special issue of the journal Energy Research & Social Science about "Narratives and storytelling in energy and climate change research" (edited by Mithra Moezzi, Kathryn Janda and Sea Rotmann). Here's the table of contents for the special issue. It has an introduction by the special issue editors, four articles on "Stories as companions to quantitative assessments", seven articles on "Government, media, and popular narratives on large system transitions", five articles on "From local to personal and professional stories", four articles on "Reimagining past and future" (this is where our article is! ), two articles on "Stories without words", seven articles on "Identities, makings, and re-makings" and finally four articles on "Participation, workshops, and engagements". That's more than 30 article altogether in this special issue! A pre-print version of our article has been available online for the better part of two months (so I could feasibly have published this blog post at the end of July), but it was behind a paywall and only half available. Also, now it's official and it's now also possible to refer to the article correctly (with information about volume, issue, pages etc.). - I saw the call for papers for the special issue in the beginning of May 2016 and started to work on "assembling the team" (16 months ago). - A one-page abstract ("pitch") for the article was submitted at the end of June 2016 (15 months ago). - A full draft of the article was submitted in mid-October 2016 (11 months ago). - We received reviews of the article in mid-December (9 months ago). - We submitted a reworked and much-improved version of the paper in mid-February (7 months ago). - We submitted the final version of the paper at the end of May (4 months ago). - A pre-print version of the article was available online at the end of July (2 months ago). There is unequivocal evidence that we are facing the greatest energy transition since the dawn of the industrial age. We need to urgently shift from a global fossil fuel and CO2-emitting energy system to 1) decrease our CO2 emissions and combat the effects of climate change and 2) face a future of depleting fossil fuel resources. Yet there is still a lack of collective action to start taking effective measures to meet these challenges. We argue that there is a need for narratives in general and for a special type of narrative in particular, allohistorical scenarios, that act as thought experiments whose main function is to defamiliarize us with what is taken for granted. Such scenarios invite us to explore plausible parallel paths, thereby making it possible to imagine futures that are essentially different from the path-dependence of an unyielding historical past. Such futures enable us to grapple with a present that is saturated by the inertia of past decisions and the sunken costs of existing infrastructure. We here present the design rationale for the Coalworld scenario: an alternative world where only half the oil ever existed. We also describe the methodology and the assumptions that underlie the Coalworld scenario.